Like all business investments, there are a few things to factor in before selecting the best security camera monitoring system to protect your company and property. Whether it is the size of the company, indoor or outdoor location, or the desire to implement new surveillance technology into an existing security camera monitoring system, the details will have an impact on finding the perfect match. Modern business owners understand the value that new CCTV equipment brings to the table. Rather than attempting to find the cheapest short-term security and surveillance solution to cut costs quickly, taking the time to determine what it is you actually want to achieve can actually save you money and trouble over time. Follow these tips to find the perfect security camera monitoring system to meet your business surveillance needs. Determine the main goal of the video security cameras. Hidden or inconspicuous security cameras are used by many businesses to record on-site visitors, monitor employees, record parking lot activities, and other practical functions without calling attention to the recording devices. This has a few different advantages and is widely used in corporate parks, commercial areas, and even small businesses. However, the main disadvantage to hidden or covert surveillance cameras is losing the advantage of having a security camera monitoring system as a deterrent for potential criminals. Determine whether your initial goal for business security and surveillance is to deter potential threats from acting or capturing security footage discreetly in the event something happens. Decide on indoor, outdoor, or indoor and outdoor security cameras. Indoor security cameras are often cheaper than outdoor security cameras because they do not require extra weatherproofing or outdoor protection. For instance, indoor dome cameras often boast comparably similar features and options but cost less than many CCTV products designed for outdoor use. Outdoor security cameras are specifically designed to be resistant to outdoor weather elements such as wind, rain, snow, sunlight, and extreme heat. They often come with a hood or built-in shade and typically require night vision or IR lights to see at nighttime. Determine whether securing an indoor or outdoor property is your goal and then find eliminate the security cameras that don’t match your specifications. In the event you want a combined indoor and outdoor system, make sure you take into account wiring and power supply options first. It’s also important to remember that just because a camera is being used indoors doesn’t mean it needs extra protection. For instance, security cameras for kitchen surveillance should be able to withstand smoke plumes and restaurant and bar security cameras might need protection from spilled drinks. Measure the overall size of the area you want the camera system to cover. Wireless security cameras are a popular option used in surveillance for business owners because they have a wider reach without being limited by cables. However, wireless security cameras are also designed ideally for open areas without any obstructions blocking the camera’s vantage point. Additionally, motion activated and auto-tracking PTZ cameras might offer business owners more surveillance coverage with fewer cameras. One PTZ security camera can cover up to hundreds of feet and track any large moving objects that come within a certain distance of the property. 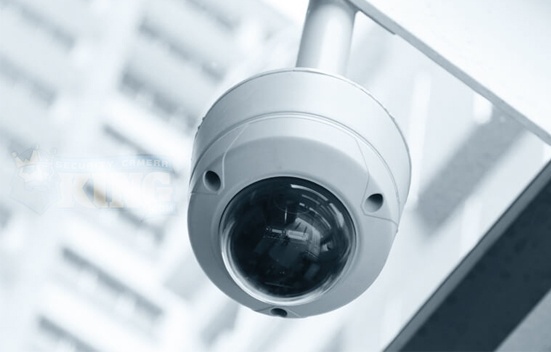 The number of security cameras you have connected to the security camera monitoring system will impact the initial investment costs and effect video storage capacity sizes. All of these things are important factors that are easier to decide once you understand the size of the area you need coverage for. Assess the lighting conditions of the areas you plan to place the security cameras. Lighting conditions will impact how clear the footage of the security camera monitoring system records and should be factored in when deciding which cameras are best for your business. If a poorly lit outdoor area is being monitored by an indoor security camera without IR or low-light settings, the footage it produces could very well be useless. Resolution size will also play an important role in how useful the security footage winds up being. Affordable IP security cameras that come in different options, including considerably higher megapixels, are now readily available for every size budget. These IP cameras can capture footage in much higher resolution than traditional CCTV cameras but are basically rendered useless without the right lighting conditions. There are many different security camera experts and professional security and surveillance companies that are more than willing to offer their experience and expertise in protecting your business or property. Contacting a local company or an online security cameras distributor can help to answer these questions and is a practical way to ensure you find the best security camera monitoring system for your business. Security Camera King is one such online security camera supplier that has decades of industry experience and enjoy an esteemed position as an online authority in security cameras, surveillance systems, CCTV equipment, and more. Contact a team member to speak with one of our security camera experts about your business surveillance needs and allow us to prove to you why, when it comes to security and surveillance, nobody beats Security Camera King. Contact Security Camera King online today for a free security assessment or call 866-573-8878 to speak to a representative of our team.